There are a number of options for improving the blood flow in your legs. It is important that the risks and benefits are discussed with you before planning treatment. The treatment can be an X-ray procedure such as angioplasty and stenting or surgery. This is a procedure which involves puncturing the artery in your groin with a needle. 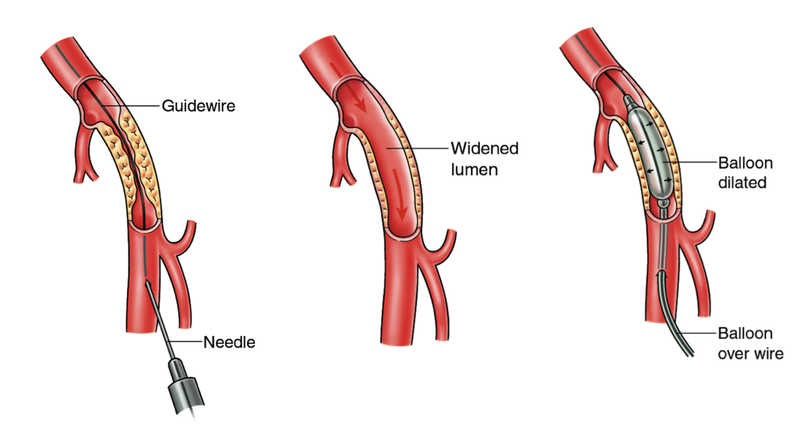 A small wire is then passed into the artery and guided to the area where the blockage.is A deflated balloon is threaded over the wire and inflated once it is in the correct position so that the narrowed area is opened out. 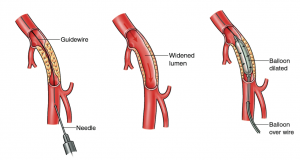 Stenting is a procedure which is done alongside angioplasty. When the balloon in the angioplasty is deflated the artery can close up again. Hence a stent is left in the artery to hold it open. A stent is a cylinder made of crisscrossing metal wires (a bit like chicken wire). The advantage of the procedure is that it is low risk and is done under local anesthetic. The disadvantage is that it is not suitable for everyone and often lasts only 1-2 years. Surgery for circulatory problems can be varied. It can be an endarterectomy similar to the endarterectomy for stroke surgery, but we operate on the arteries of the leg rather than the neck. More commonly it involves doing a bypass operation in the arteries of the leg. If an artery is blocked, then a tube is run from the normal functioning artery above to a normal fucntioning artery below. Blood will flow down this tube to get down to your legs and feet. This tube can be a vein, which runs along the inside of your leg or a synthetic tube made of Dacron, as used in aneurysm repairs. A scan will be done before hand to determine the exact treatment. This is fairly major surgery and the pros and cons will be explained to you before making a decision.